I’m so pleased to have Rebecca Pugh on my blog today. Rebecca’s blog, Becca’s Books, was one of the first I followed when I started blogging and she writes really fabulous book reviews. But she is also an author with Carina, with her third book due to be released in August, more about that below. And it is with her author hat on that she is answering questions today. Thanks ever so much for inviting me to take part in your Author in the Spotlight feature, Joanne. I’m delighted to be here. A little bit about myself? Well, I’m an avid reader and writer. I adore anything to do with words, whether that be crafting my own or enjoying someone else’s. I’m also a book-blogger over on Becca’s Books, where I review books and then share those reviews with other potential readers. I also write women’s fiction for Carina UK, a digital first publisher, and I’m currently writing my fourth book for them. There’s lots going on at the moment and I’m surrounded by words on all sides but I believe that’s rather a nice place to be in, don’t you? I’m a lover of the countryside, days out by the sea and delicious food. I’m also a huge family girl (eldest of seven children) and I adore new pyjamas and fresh bed sheets. I love the small things in life! I think it was, quite simply, reading. Even before I began Becca’s Books and was able to get to know a lot of authors through chatting with them on social media, I’d thought of authors with a sense of awe surrounding them and what they did. Books have always been wonderful in my opinion. When I was younger, I actually fell behind in my reading at school, stumbling a bit while everyone else was steaming ahead. This phase, if you’d call it that, didn’t last long though, and it seemed that once I’d managed to get the hang of it, and once I’d realised what fun it actually was to lose myself in a story, I couldn’t stop, and I’ve been carrying on ever since. So yes, in answer to your question, it was reading which inspired me to begin writing. I wanted to be able to do what those authors did. Weave a tale so beautifully it was like you’d stepped into a different world entirely. It had always felt like magic to me. Carina were the only publisher I submitted my writing to. I didn’t expect, in a million years, to hear anything back from them, never mind an email arranging a phone-call. I remember taking our dog, Bonnie, for a walk beforehand and thinking to myself, ‘If there is any chance that this is what I think it could possibly be, I will scream my head off.’ The world seemed to stand still when I heard the words, ‘We’d like to offer you…’ travel down the line. It was surreal and terrifying yet so incredibly exciting all at once. I couldn’t deal with the emotions that were suddenly surging around my body like volts of electricity. It was too much. I then phoned my partner and started blubbing down the phone, and of course I phoned my lovely mum who was full of praise, which had me crying all over again. It was a day I will always remember, without a doubt. 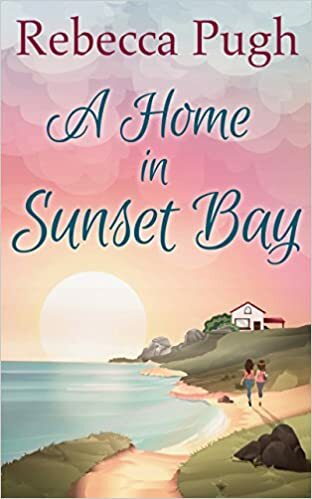 My latest book is called A Home in Sunset Bay and it’s about two sisters, Mia and Laurie Chapman who, after life has led them in separate directions, are pushed back together again. It’s set in the fictional seaside town of Sunset Bay in Cornwall, and features Dolly’s Diner, fish and chips, a sprinkle of romance and a heap of rediscovery. I had such fun writing it and the reviews so far have been very positive. It’s the type of place I’d like to spend my summer which is how I’ve been hoping readers will react too. I really enjoy thinking up the titles for my books, and for A Home in Sunset Bay, it sort of fitted perfectly. Sunset Bay made me think of the beach, the colours of the sky melting into each other after a long, hot day, the heat and the ice-cream. All in all, it captured beautifully what the story was about and how finding a place to call home can sometimes take you by surprise. I celebrated the publication of A Home in Sunset Bay by enjoying a delicious pub lunch with my partner, and then spending most of the day reading through everyone’s comments/tweets and replying as quickly as I could! What I’ve always loved is that the publication of my debut novel Return to Bluebell Hill happened to fall on my mum’s birthday. It made it all the more special for me, and for mum, I’m sure. I certainly do! I’m currently in the process of revisions for my third book Down on Daffodil Lane (arrives August 8th), and I’m also writing book four as I go along. I’m really excited about sharing another story with readers. Oh, great question! I think I’ll have to go with the ‘favourite three’ option because there are quite a few. I’ve recently read and loved My Husband’s Wife by Jane Corry. It was compelling and addictive, and Jane Corry had clearly done her research when it came to crime and prison. It was a gripping read. Another has to be In Her Wake by Amanda Jennings. This is another book I couldn’t bear to put down once I started. From beginning to end, it had me riveted. There were plenty of twists and turns along the way which made it all the more exciting. For my third choice, I’d have to say Summer at the Comfort Food Café by the wonderful Debbie Johnson. I absolutely adored this story. It made me cry within just the opening pages, then had me grinning through the last. If you fancy a trip to Devon this summer, then I’d certainly recommend this book. As of right now, May 2016, I am at the very end of Kerry Fisher’s After the Lie, and also nearing the end of All Things Cease To Appear by Elizabeth Brundage. 90% of the time, I use my Kindle when reading and, thanks to its built-in light, I’m able to read late into the night too. My partner is unable to sleep with the light on, so reading a paperback at night is impossible. This is why I take so long to finish reading a paperback and read eBooks a lot faster. I adore reading in the bath, although I must stop taking my Kindle in with me, because I know that one day, I will drop it in the bubbles. Perhaps then I’ll learn my lesson? I tend to do most of my reading in the evening because the day is usually taken up by other things, as well as being dedicated writing time. There’s a few different ways people can follow and connect, and I’m always happy to say hello! What an excellent question! Gosh, I’ve met some wonderful heroines over the years and it’s typical that not a single one will come to mind now. I think I’d quite like to be Paige from Sarah Morgan’s Sleepless in Manhattan, or Suzie from Holly Martin’s One Hundred Proposals.